Milagros is a Spanish word for “miracle” or “surprise,” and for many years the little charms have been used in prayer petitions and thanksgiving. For example: If your request is to heal a broken relationship, or for someone who has had a heart attack, the image could be shaped as a heart. The charms are attached to a cross, an altar, a wall of a church or to a statue of a saint. To learn more about the Milagros and for directions on how this project can be used as a Lenten project, go to the lesson plan. You’ll find a supplies list and directions for making a “Milagros Cross” in the 6th Grade Projects Gallery in the sidebar to the right. 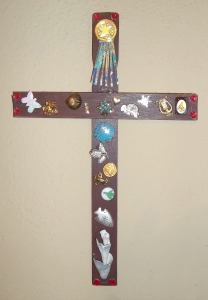 This entry was posted in Categories and tagged 6th grade, art project, crafts, cross, elementary art, lenten, milagros, milagros cross, spanish. Bookmark the permalink.